Are Video Interviews the Future of Hiring? Job interviews have always been intimidating. What to wear, what to say, how to prepare — mastering the art of the interview is a job within itself. With the growing popularity of video interviewing, that job could get a bit more confusing. This detailed infographic, created by PGI, explores the growth and reasoning behind video interviews, including a few secrets for best Skype practices. So during your next online interview, try sitting up straight in good lighting — it just might land you the job. The rate of growth of IT employment further accelerated in June, posting another all-time high. The number of IT jobs grew 0.51 percent sequentially last month to 4,473,300, according to TechServe Alliance, a collaboration of IT & Engineering Staffing and Solutions firms, clients, consultants and suppliers. 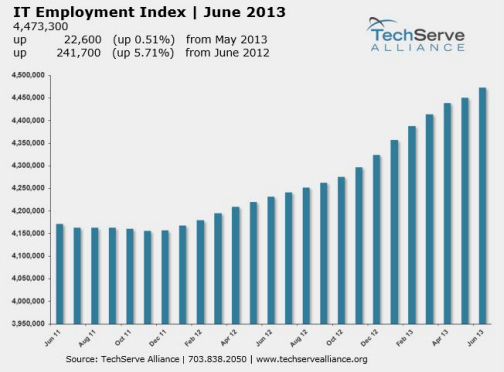 On year-over-year basis, IT employment has grown by 5.71% since June 2012 adding almost 241,700 IT workers. “While IT employment has been on the upswing for some time, June’s numbers are clearly evidence that pace is accelerating,” stated Mark Roberts, the CEO of TechServe Alliance. “While I have said it before, it bears repeating because of its importance: an inadequate supply of talent, not demand, represents our greatest challenge to achieving the full potential for IT employment growth in the U.S.,” added Roberts. Last month Swiss Professor Heike Mayer mapped out the rich history of Kansas City’s nearly 600 tech firms and institutions. The data funded by the Ewing Marion Kauffman Foundation shows Kansas City’s vast entrepreneurial development over the past 50-plus years. More than 200 entrepreneurs provided data through an online survey Mayer conducted between 2012 and 2013. Mayer’s research shows that around a dozen firms and institutions—including the University of Kansas, Sprint, Marion Laboratories, MRI Global, Perceptive Software, UMKC and Cerner—have produced a majority of the IT and bio sciences companies in the Kansas City region. 70 percent of Kansas City entrepreneurs used personal savings to launch their start-ups, while just 9.4 percent accessed venture capital. They cited difficulties in accessing capital locally, as well as local shortages of technology, marketing and sales talent. Advantages of the region include informal local access to innovative people, ideas and technologies, as well as supportive local entrepreneurship organizations and initiatives. Respondents gave mentors who give advice the highest rating (52.5 percent) as sources of new ideas for Kansas City entrepreneurs; customers and users followed at 43.8 percent. 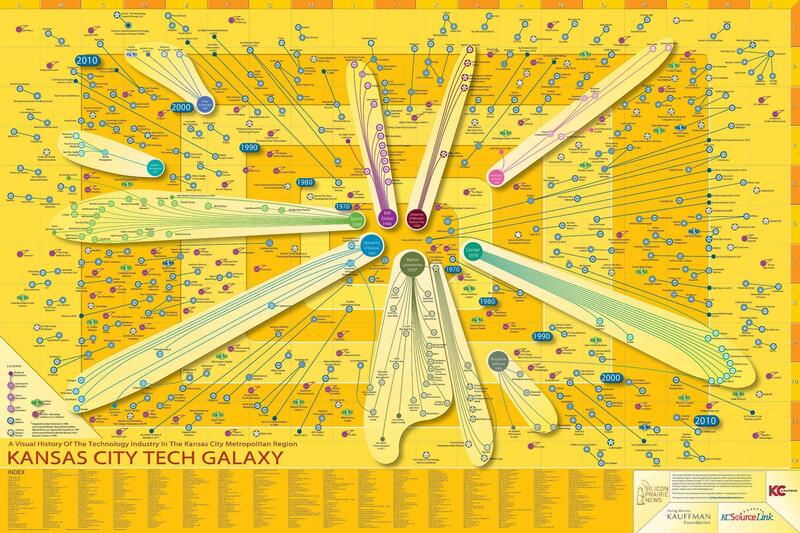 Can you spot your own company in the Tech Galaxy? Mayer considers the Tech Galaxy Map to be an ongoing process and encourages local companies to provide their own data. The form is available here.